Charles “Skip” Lawrence Watkins, 78 of Clarksburg passed away on Thursday, November 29, 2018 at St Joseph Nursing Care Facility in Buckhannon. He was born September 8, 1940 in Clarksburg, son of the late, Eugene William and Evelyn Naomi Dennison Watkins. Skip was a truck driver for C.O. Dennison Trucking and retired as a coalminer with KITT Energy. He enjoyed the outdoors. He is survived by his brother, Terry Eugene Watkins and wife Charlotte, North Myrtle Beach, SC; his sister, Debby Lynn Stonestreet and husband Lee, Bridgeport; brother-in-law, Robert Radcliff, Philippi, WV; nieces and nephews, Jared Watkins, Bridgette Stonestreet, Brian Radcliff, Jeff Radcliff and Donna Price; longtime companion, Drema Merritt and her sons, Clifford Merritt and Brian Merritt; Drema’s eight grandchildren, and Drema’s five great grandchildren and two were special to Skip, Caylee and Kiera “Pork Chop”. In addition to his parents, he was preceded in death by one sister, Jeanne Radcliff; one nephew, Michael Stonestreet; Drema’s son, Timothy Merritt. Family will receive friends at Davis Funeral Home, 124 Olen Thomas Dr., Clarksburg, on Sunday, December 2, 2018 from 2-5PM. Online condolences may be sent to DavisFuneralHomeWV.com. 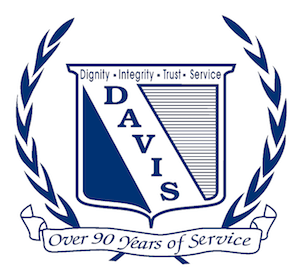 Davis Funeral Home is honored to assist the Watkins family.